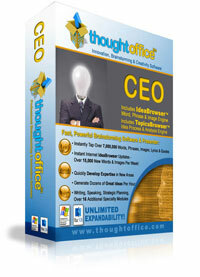 ThoughtOffice CEO is the all-in-one associative thinking, innovation, and brainstorming tool. A combination of desktop and Internet software used by executives in Inc. 500, Global 200 and Fortune 2,000 organizations to find opportunities, capitalize on ideas, solve critical business, innovation, marketing, advertising, strategic planning and positioning issues. • 13,700 questions drill down on 16 separate topics. • 9,523,680 words, phrases, quotes, definitions and images updating at more than 12,000 new terms per week provide creative fuel. • All available at the click of a mouse. Our most complete associative thinking brainstorming tool. A genius brainstorming and problem-solving partner who works day and night to get you the answers you need to conflict resolution, advertising, marketing… and 13 additional areas critical to almost every business. You get 16 modules developed by MBAs, CEOs, Coaches and leading applied talent, all tightly integrated in one easy to use program. ThoughtOffice CEO takes our powerful word-linking and Image databases and enhances your processes through the addition of our complete module set – all tightly integrated within one easy to use program. Need amazing ideas for developing a Mind Map? Creating a new product? Crafting a world-class advertisement? Solving a BIG business challenge? You can do it all with ThoughtOffice CEO. Start by either typing a word or phrase, or go to the exclusive eXpertTopic Modules and use the thousands of prompts to crisply define your problem… then use the integrated IdeaBrowser Creativity Engine to open the door to a thousand new ideas. All of your words, thoughts and associations are delivered in one mouse-click to the integrated Session for later reference. You can literally see your stream of thoughts on paper. ThoughtOffice CEO is perfect for the individual who needs to solve an immediate problem, or create unlimited dynamic solutions to business, educational or personal issues.